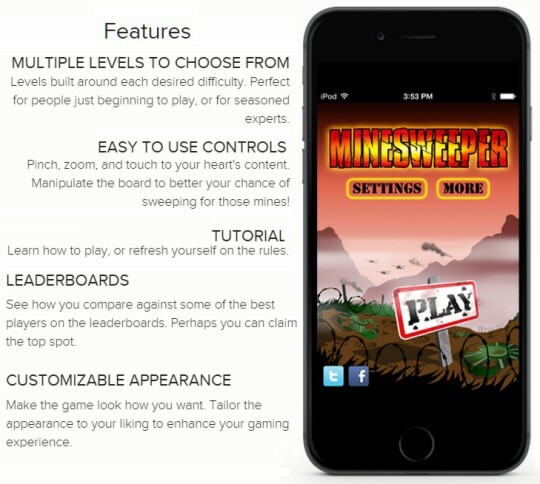 Stacy Tilton Reviews: Minesweeper made for mobile = Classic gaming on the go! 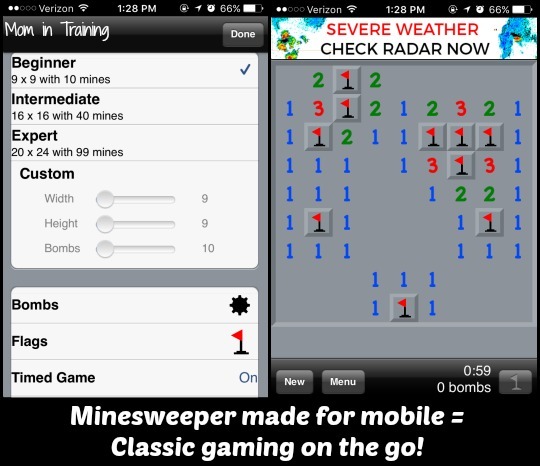 Minesweeper made for mobile = Classic gaming on the go! I can remember playing Minesweeper on my computer when I was growing up, and it was probably even the first thing I taught my kids to play too. At the time it seemed like it was so complex and one might never find all those mines. Fast forward...well lets just skip how many years and now we can enjoy a classic favorite on the go with the mobile version. Since I recently downloaded the game on my iPhone I've been playing it at least once a day when I need to pass some time. It's even brought back memories of Minesweeper challenges I used to have with my husband back when we played it on the computer. We used to make bets on who could do the harder board faster, or go the longest without hitting a mine. You know back when things we so much simpler and not quite so complex like they are with modern day games. Remember Minesweeper – the game that had you thinking, plotting, scheming and strategizing? Well, now you can play that very same game on your iPhone and iPad. The principle is the same – clear the board of mines without blowing yourself up. The in-game tutorial lets you easily and quickly brush up on your bomb-finding skills and will soon have you moving from the Beginner to the Expert level. This is the perfect game for those of you who like strategy – Sweep Those Mines! will keep you entertained and challenged for hours. I've actually really enjoyed having this classic on my phone and am now wondering which one I should download next. What do you think? Spider Solitaire, war, or maybe Freecell Solitaire, it's so hard to choose!